The following awards will be judge virtually: Outstanding Early Career Teacher, Outstanding Agricultural Education Teacher, Outstanding Middle/Secondary Ag Ed Program, Outstanding Postsecondary Agriculture Program, and Teacher Mentor. Each committee volunteer must be a NAAE member and will judge up to 10 award applications using the required NAAE Award Judging Rubric that will be provided to you. NAAE Judging Committee members must submit their scores to the NAAE office by June 15th. Click here for more information and to volunteer! Seats Available for Natural Resources and Ecology CASE Institutes! Looking to add diversity to the courses offered in your agriculture program? Check out the Natural Resources and Ecology (NRE) course offered by CASE. Seats are still available at CASE Institutes in Indiana, Minnesota, and Oregon. Check out the complete CASE Institute schedule or register for a CASE Institute today! Presented by Zoetis, the Veterinarians on Call YouTube channel features real-life vets doing a variety of tasks. This week, Dr. Lindsey Peck of Marks Farms says she wants to make sure her son is exposed to farming because that's how she and her brother were raised. She gives us a tour of her calf barn and explains how she cares for all the baby cows. Follow this link to view the video. Last week we celebrated the birthday of Booker T. Washington by featuring him in the Friday Footnote. This week we are celebrating the birthday of another prominent American with strong ties to agriculture. That person is Thomas Jefferson; his birthday is tomorrow, April 13. And we are welcoming back a guest columnist, Dr. Jim Connors from the Univesity of Idaho. Click here to read more. Know of a member in your FFA chapter who loves to perform? The National FFA Band, Chorus and Talent may be their ticket to stardom. Applications are now available. Read more about the programs and application process here. Email questions to bct@ffa.org. In this video, Jorge Heraud, CEO and co-founder of Blue River Technology, explains how machine learning and robotics can make farmers more profitable while reducing environmental impact. An activity sheet for this video and additional videos about agricultural technology and innovations can be found at FFA.org/blue365. If you love animals and visiting zoos, then check out FFA member Nicole Ford’s supervised agricultural experienceworking at the Louisville Zoo. A member of Seneca FFA in Kentucky, Nicole works in the MetaZoo, an educational center, and performs a variety of duties—from cleaning cages and caring for the animals to educating visitors about the zoo’s different species of wildlife. To see even more SAE ideas, visit our SAE Video Library, which also features accompanying lesson plans and activity sheets. Visit FFA.org every week to catch up on all the great FFA stories happening across the country. Don’t forget that we’re always looking for stories to include on the website, our social accounts, in FFA New Horizons Magazine and on FFA Today on RFD-TV. Make sure your chapter gets its share of the national FFA spotlight! Share your ideas at FFA.org/submit-your-story-idea/. The 2019-2020 Yearlong Living to Serve grant application is available now for FFA chapters to apply for up to $3,000 to support yearlong service-learning projects that address community needs in one of four focus areas: Community Safety; Hunger, Health and Nutrition; Environmental Responsibility and Community Engagement. Need ideas for yearlong service-learning projects? Check out the interactive map at www.ffa.org/livingtoserve to review funded projects. Additional information on the grant can also be found on the website. Applications are due June 17th, 2019. Registration is now open for the next National FFA Alumni and Supporters Regional Development Conference which will be held in Dover, New Hampshire May 17-18, 2019. This is a free, hands-on training for FFA Alumni members, advisors, or anyone interested in starting or developing an alumni and supporters chapter. For more information about this and other RDC’s, visit www.ffa.org/gotordc. 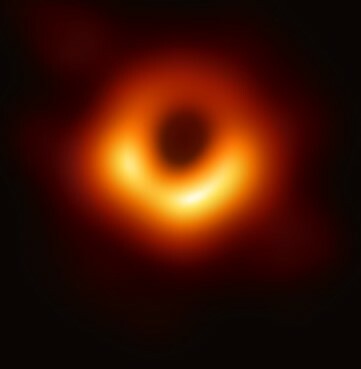 The image may look like a cyclopean happy face, but the black hole photo brought cheers from scientists and awe from the public. Friday, April 12, 2019: The Ag Census Report is out, CAST holds events in D.C. next week, and an amazing photo of a black hole captures the world’s attention. These and many more ag/science stories in this week’s edition.